Started playing around more with Vinyl Master and the node editing capabilities. One thing I could not figure out, or if it's even possible, was to delete a line segment between two nodes. For example, if I have a circle that is made up of 4 nodes, top, bottom, left and right. Is it possible to delete the segment between the Top and Right nodes so that I am left with a 3/4 circle line? The best I've been able to do so far is to delete the arc but have it replaced with a straight line connecting the nodes. I want the shape to be open, no longer a shape, just a simple line. In Inkscape, this ability it called "Delete Segment between two non-endpoints", is there something equivalent in Vinyl Master? Try selecting the shape and right clicking, top, "convert to: curves"
Already did that. can't edit the nodes till you convert to curves. I suspect this ability does not exist in the software. May take some time to get use to, but so far, I'm not a fan of the edit nodes capabilities. I like my nodes to be on the line in question. For curves, VM has them floating off at what would be the intersection of two lines. I can see how that could be handy at times, but they way I think of nodes and editing them it does not work for me. If the object is curves and is not grouped you can work in Node Edit mode (click 1 below) and use Break Curve (at two points, see 3 below) to create a segment (Tip: set the curve Object to wireframe fill, by selecting it and clicking 2 below). 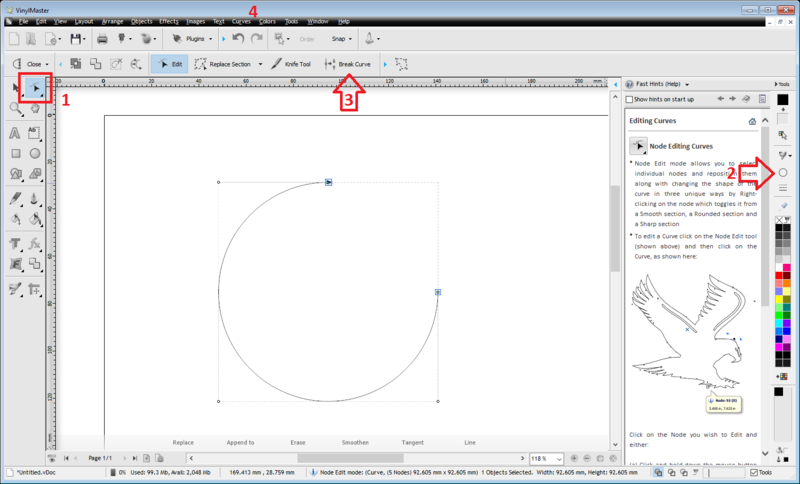 Next click the Curve (menu) > Break Apart (4) and then delete the segment. Thanks, I could have sworn I tried that. Just tried it again and it worked, so I don't know what I was doing last time. It did do one thing I was not expecting, when I deleted the curve, it was replaced with a straight line joining the two nodes. So I selected that and deleted it and got to the results pictured above. Ok, and now I can't do it again. I do the two break curve points and a line appears joining the two points. When I then do a break apart command, I get a sliver of the circle and a 3/4 circle with a line joining it. I can delete the sliver but the line segment joining the curve I can't delete. And to add additional confusion, I just tried to do it in order to get screen shots of what it was doing and now I can delete the line segment. Something is weird. Ok, think I figured it out, and I think this could be a bug. If I'm in wireframe mode I can not delete the line segment. When I do the break curve at the two points I get image on the left. When I break apart I then get two pieces as on the right. Now, if I am not in wire frame mode, but rather use wire frame fill as mentioned in the previous post then I can delete the line segment and get the desired 3/4 circle.